More information about this operation will be posted in the near future. GlobalFire members from across Canada deployed to the island nation of Saint Vincent and the Grenadines for a 2 week supply and training operation. supporting the Royal Saint Vincent Police Force's Firefighters. GlobalFire sent two shipping containers of fire fighting suits, hoods, helmets, boots, gloves and self-contained breathing apparatus (SCBA). This equipment was distributed to Bomberos (Firefighters) around the La Paz region. GlobalFire members organized to assist in the search for Fire Chief Clayton Cassidy of the town of Cash Creek in British Columbia who was swept away by flood waters. Further information about this operation will be posted in the near future. GlobalFire supplied vehicle extrication tools to Bomberos (Firefighters) in the city of Retalhuleu, Guatemala. This build upon previous supply, training operation as well as a vehicle donation. As wildfires burned through Canadian cities, GlobalFire responded with logistical support for fire crews and assistance to communities destroyed by the largest urban/wildland interface fires seen in Canadian history. More information about these operations will be posted in the near future. In an effort to reduce the number of migrant drowning deaths as overloaded boats attempted the hazardous illegal crossing from North Africa to Europe, GlobalFire sent marine rescue boat pilots and rescue swimmers to Greece to conduct rescue operations and instruct local crews in watercraft rescue techniques. GlobalFire distributed fire, rescue and emergency medical supplies to fire services across large areas of Ukraine's Eastern region. All equipment was provided for free. More information about these distributions will be posted shortly. From April 2015 until May 2016 GlobalFire gathered, shipped and distributed much needed fire fighting and rescue equipment to Ukrainian emergency service authorities. The Firefighters and Paramedics in the Eastern conflict region had been serving the civilian population with very little proper equipment and meager resources. The equipment was donated for free by GlobalFire and will go a long way to help save life, property and the environment. These SDOs (Supply and Distribution Operations) sets the stage for future GlobalFire operations in the country. GlobalFire conducted several Supply and Distribution Operations within the Philippines in 2015. In November 2015, a dozen GlobalFire members from across Canada and the United States travelled to Nicaragua to conduct a two week Capacity Building Operation (CBO) in which they would equip and train Bomberos (Spanish for firefighters) from 17 different volunteer fire / EMS departments situated throughout the country’s Northwest. In June 2015, a team of GlobalFire volunteers was sent to the city of Kiev to aid in humanitarian relief efforts by meeting with local emergency services to assess their needs and develop a plan to facilitate supporting them in future GlobalFire operations. The team was also tasked with deploying to the city of Mariupol in the conflict zone to assess the needs of emergency services there and install a special window treatment called 3M Blast Film on vulnerable buildings such as kindergartens, clinics and maternity hospitals to help protect civilians from concussive blast effects on windows caused by artillery fire. A massive 8.1 magnitude earthquake struck Nepal on 25 April 2015. Over 8,000 people were killed and more than 21,000 were injured. The earthquake triggered huge avalanches throughout the mountainous country. Hundreds of thousands of people were made homeless with entire villages flattened, across many districts of the country. GlobalFire members responded to work with local authorities and to deliver humanitarian aid, especially drinking water purification units, to the hardest hit remote regions. 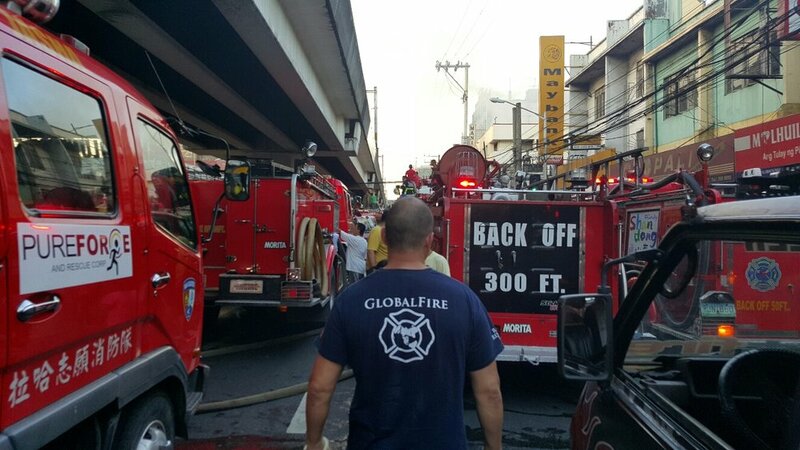 GlobalFire members also conducted a needs assessment of the fire and emergency medical services in affected cities to help remedy equipment and training deficiencies during future aid operations. Knowing that their country was susceptible to earthquakes, the Shechen Monastery in Nepal and CGLF invited GlobalFire volunteer Chris Wilvert to train their monks, students and staff on earthquake preparedness via a series of workshops. From February 8th to March 10th 2015, GlobalFire was on the ground conducting a Risk Analysis to Disaster Response training program. The second phase of this operation took place from May 6th to May 16th 2015, after the country’s massive 8.1 magnitude earthquake. It was requested by the same entities that had been trained a few months earlier, to come and assist with response and recovery teams with Shechen, and perform follow-up visits to the monasteries, health clinics and schools where the training workshops had taken place. On March 13 2015, Tropical Cyclone Pam smashed into the small island nation of Vanuatu at the peak of it's strength. The storm devastated local infrastructure and the government requested assistance. GlobalFire volunteers packed a large shipment of relief supplies on 19 Mach. Charity members were soon on the ground providing assistance throughout the island. More information about this operation will be posted in the future. More information will be posted about this operation in the future. Throughout much of 2014, the world watched as West Africa was gripped by the worst outbreak of the Ebola virus in history. As the epidemic spread so did the international community's desire to help. GlobalFire volunteers from across North America gathered and shipped critical protective equipment for emergency workers on the front lines who were battling the epidemic. GlobalFire deployed a team of Firefighters, Paramedics, students and civilians to conduct a two week supply and training operation in the city of Duran. Local Firefighters and Paramedics were equipped and trained for free. More info on this operation coming soon. This was GlobalFire's 3rd emergency service aid shipment to The Philippines in 2014. The focus was to get fire fighting and emergency medical equipment to outlying cities and towns that were poorly equipped by the government. Communities in and around Buffalo New York have had to battle not only record amounts of snow, but have also faced threats of flooding. GlobalFire shipped fire fighting protective equipment to Firefighters in the city of La Paz in an effort to improve their safety and their ability to perform the world's most dangerous job. This supply and distribution operation will set the stage for possibly conducting a supply and training operation at a later date. On November 8th 2013, the most powerful storm ever recorded to make landfall, struck the Philippines. Four days after this devastating event, GlobalFire volunteers arrived in the hardest hit area of the Philippines, Leyte province. For 95 days the focus of our operations was disaster response, but as time passed, they have now shifted to capacity building. After Super Typhoon Haiyan (called Yolanda locally) struck Southeast Asia in early November 2013, GlobalFire volunteers from across Canada deployed to locations across the hard hit Philippines to render badly needed humanitarian aid and work alongside local fire and emergency medical authorities to determine how best to assist them by providing equipment, training and repairs to their devastated emergency infrastructure and capabilities. More information on this program will be posted shortly. A team of GlobalFire volunteers travelled to Guatemala in September of 2013 to train and equip Firefighters in the province of Retalhuleu. Due to the financial realities within the country, many Guatemalan fire departments are under equipped. The aim of GlobalFire’s deployment was to provide several fire/EMS departments, spanning an entire province, with needed fire, rescue and emergency medical equipment as while simultaneously conducting an advanced training course. 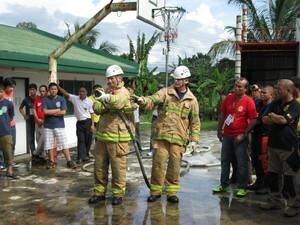 After conducting a CBO (Capacity Building Operation) in The Philippines in 2012, GlobalFire subsequently sent several shipments of thousands of pieces of technical emergency equipment and training materials and distributed it for free to dozens of Filipino Fire and emergency medical services throughout 2013. More information and photos about these Supply and Distribution Operations can be located in the SDO description tab. In January of 2013, a GlobalFire team of instructors deployed to Roseau on the Isle of Dominica for 2 weeks to bring support, training and equipment to our fellow Firefighters. The areas of training and study included the following: fire fighting tactics, HAZMAT response, search and rescue operations, Firefighter rescue (RIT team) operations, forcible entry, Firefighter self-rescue and water rescue awareness. On November 6th 2012, GlobalFire members from across Canada deployed to the Philippine Islands for a 2 week “capacity building operation”. This operation was designed to focus on supply and training to help support poor fire departments throughout the Philippine province of Negros Occidental. In March 2012, GlobalFire deployed a team of Canadian firefighters to train and donate equipment to firefighters in Cambodia. The mission, which lasted 14 days, is the second Capacity Building Operation (CBO) GlobalFire has conducted in the area, and was designed to build upon the framework established during the 2010 CBO. In March 2012, a GlobalFire volunteer asked to include a GlobalFire supply mission during his vacation to Puerta Plata in the Dominican Republic. This is just another excellent example of the dedication and compassion GlobalFire members demonstrate during their personal time. From April 31st to the 14th of May, GlobalFire team members provided capacity building support to the Government of Jamaica’s fire service in the form of training in both Hazardous Materials Response and Fire Cause determination as well as the delivery and dissemination of approximately $150,000 CDN worth of fire equipment. More information about this operation coming shortly. In October 2011, GlobalFire supplied donated bunker gear (AKA “turn-out gear”) to Costa Rica. This is the type of personal protective equipment that is required by firefighters, so that they may operate safely and effectively in very hazardous environments, while performing the worlds most dangerous job. In October 2011 a team of GlobalFire volunteers travelled to Northwestern Nicaragua to conduct a two week "Capacity Building Operation". The aim of which was to supply and train volunteer Bomberos (Firefighters) from several cities. In April 2010, GlobalFire members were invited to train the Firefighters at the Siem Reap International Airport. The team arrived in Siem Reap as the shipping container sent from Canada cleared customs. Supplies from the container were distributed to the airport's fire service to improve their fire fighting capability.